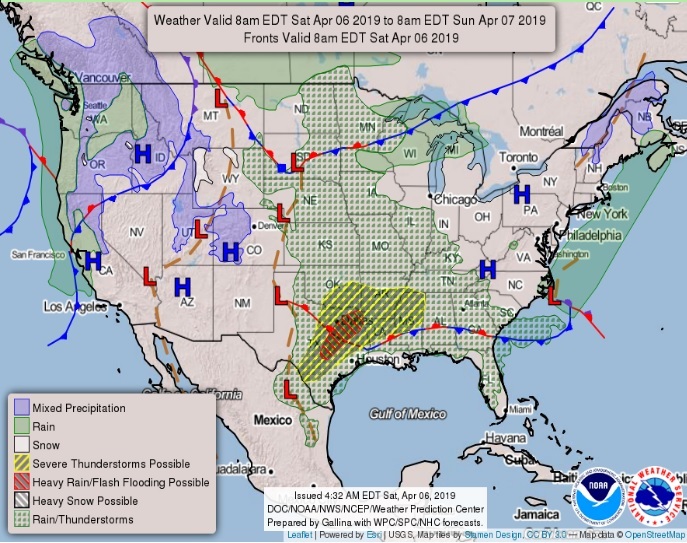 This Hazardous Weather Outlook is for portions of North and Central Texas, South Central Arkansas, Southwest Arkansas, North Central Louisiana, Northwest Louisiana, Southeast Oklahoma, East Texas, and Northeast Texas. Strong to severe thunderstorms will be possible today and tonight across the area. The threat will increase west of I-35 this morning, encompassing most of North and Central Texas by midday, and then possibly shifting southeast of a Lampasas, Hillsboro to Canton line this afternoon and early evening. Showers and thunderstorms should be ongoing across portions of East Texas, Northwest Louisiana, and Southwest Arkansas Sunday morning, and will become more widespread in the afternoon, ahead of the parent upper-level storm system. It will begin to eject northeast across Central Texas slowly. Given the instability at the surface and aloft present, some of these storms may become severe, with damaging winds, large hail, and locally heavy rainfall. Localized flash flooding cannot be ruled out as well, especially in areas where storms repeatedly move over the same areas. Large hail between a quarter and ping pong ball size, damaging winds more than 60 miles per hour, and isolated tornadoes will all be possible. and isolated thunderstorms will persist late Sunday night through Monday near the center of this storm system as it drifts east over the region. Much warmer temperatures and mostly dry conditions are expected through the remainder of the week, although isolated showers and thunderstorms will be possible Thursday afternoon and evening over portions of Southcentral Arkansas and Northcentral Louisiana near a cold front. In addition to the severe weather, the threat of flash flooding will increase across Central Texas northeastward into East Texas this afternoon with any slow moving storms. These storms are expected to intensify this afternoon as instability increases from daytime heating and near a warm front that will lift north across the area, with the potential for severe thunderstorms increasing as well. Damaging winds, large hail, isolated tornadoes, and locally heavy rainfall are the primary threats, with the potential for localized flash flooding where storms repeatedly move over the same areas. These storms should gradually diminish this evening, but additional shower and thunderstorm redevelopment are expected late tonight especially over East Texas, Northwest Louisiana, and Southwest Arkansas. Some of these storms may also become severe, with locally heavy rainfall possible. Central Texas on Sunday may pose a continued flash flooding potential Sunday afternoon and evening. The severe thunderstorm threat will end from west to east Sunday night with the arrival of a cold front. radio operators will likely be needed today and tonight.